The film 3x Trouble ended with a begging question in my head, why the 15 minute crash attempt to untie the narrative knots in the film at the end? It marred what was a suspenseful and exciting one and a half hours of drama, action, thrills and delightfully, laughs. To give the film credit, it might be appropriate to look at the film before the end credits appeareed and after the credits appeared where the film went into explanation mode. 3x Trouble is a collaboration of talents from Malaysia, Singapore and Taiwan and Singapore’s main contribution to the film is Dai Yang Tian of ‘Little Nonya’ fame, in a leading character called San. The film is rightfully classified as Malaysian given the setting and spirit of the story. 3 close friends, Hai, Tian and San, enter a fateful journey of chills and thrills when they decide to steal a car upon knowing their money will be hard to come by from running their pasar malam (night market) stalls in KL. While not always true, the first 15 minutes of the film can give a clue to if the director has a firm grasp on the vision and groove of the film. 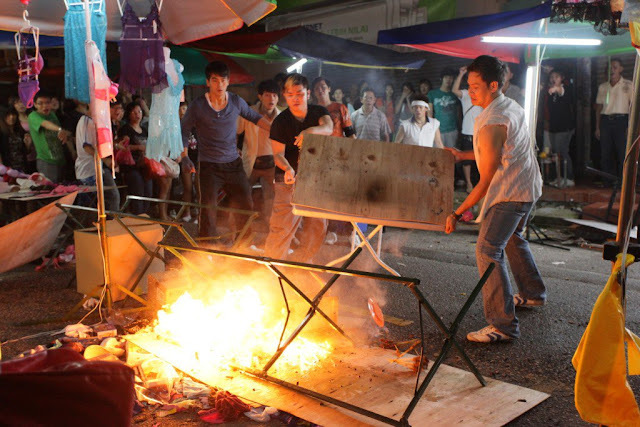 Delightfully, director Patrick Yau skillfully orchestrates a riot of laughs and even drama out of an everyday pasar malam scene. While using the old-fashioned antics like undergarment jokes, the humour served is fresh and original. This also set the tone for the entire movie – one of adrenalin pumping drama and action, peppered with laughs of the right note. And not a single joke was missed by the audience. Moving from the prologue, the film is consistent in its narrative hook and gets you almost at the edge of your seat (but good enough) for most of the time. The three men steal a car, discover a dead woman’s body in the boot, try to get rid of it but she keeps coming back. Meanwhile, a killer is lurking in the background seeming to want something from the men. It sounds like the ingredients of an suspenseful journey. And it was. In honesty, the film’s success lies in its mastery of moments. Just to give some examples, the men when trying to dump the dead body at a Chinese temple found themselves stuck in a comically compromising position with the corpse when they had to hide. In another scene on the highway, the men were stopped by the police and were shivering in fear of the police wanting to check the contents of their truck. Knowing there was a dead body inside, they thought they were doomed when the police insisted on opening the truck. But as the previous scenes have shown, the film is not short of nifty ideas and twists. Finally, in a clever payoff to Hai’s hilarious mobile ring tone, which consists of a nagging voice, the mobile rings in the middle of rather crowded confrontation scene. The ringing served not only to turn the tide of the confrontation but also potentially becoming a turning point of the film. In the end, it was more a tease but the thrill of anticipation was worth it! However, the mastery of moments seems to occur at the expense of a consistently structured plot. In fact, the narrative flow seems uneven at many points of time. There will be moments where the film tries to pack too many clues or drop too many narrative teasers while there are other moments that seem to focus on serving up comic antics or thrill the audience with a ‘killing’ moment. The convoluted ending with a few lives claimed is a case in point. Really, some of the characters did not need to die! Every action movie needs a crowning glory which is a grand chase scene. 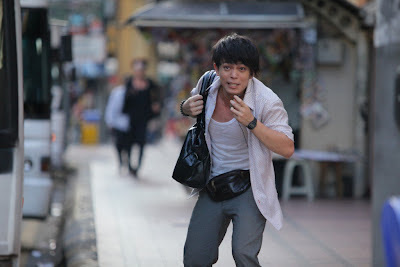 While the streets of KL offer very little aesthetically that would heighten the drama of a chase (unlike the steel jungles of Hong Kong), the film added dimension to the city through the concept of having a chase while being directed by a ‘human-GPS’ system – essentially using binocular vision from a building top to orchestrate an escape. While the chase between the two men is nothing fancy, no knocking down of cargo or causing of car crashes, following the frenzied directions of Hai who was perched on top of a building, in order to able to direct an escape, is like being on an old-fashioned computer game of Pac Man where you watch the playing figure scuttle through a maze. It even has a local touch to it – the notorious KL traffic jam! It is would really do the film injustice to judge it by the post-end-credits segment. Strangely enough, at the point of time when the credits were about to roll, the film felt like it had been resolved narratively and things have come to a closure. Must be the ‘shoot-out’ effect. It was not until when the film tried to explain the identity of the dead woman, rather hurriedly, that one realizes that many questions had been unanswered. I personally think the beauty of this film is that these gaps did not look like gaping wounds. Explaining them in full just made the gaps seem bigger than they really were. So interestingly, this shows how the human mind is more mood-driven than logically driven and that there is no equation to balance in telling a story, just an experience to create.